Someone from the tech world wrote me back! Last week I was caught in a false internet meme of a tech guy yelling at the protestors who body-blocked the Google bus to call attention to the housing crisis in San Francisco. He was quickly identified not as a man from Google, but a labor organizer who wanted to provoke a debate. I was humiliated by being duped by this, as I confessed in my last blog post. I was so ready to believe this angry man was a Google employee because he said what I feared those people think as their huge flood of cash cleanses the city of natives like me. Yet, as I said when I confessed I’d been duped, I don’t know anyone from Google. I don’t know what they think or how they feel and it was wrong to make those assumptions. Taking up that challenge is a man who rides in the Apple bus from San Francisco to Cupertino to work every day. He responded to my blog post because he has been stung in his own way by the hostility to him and his co-workers. I agree with the writer that it is very un-San Francisco to demonize newcomers. One thing this city is known for is acceptance, but in my mind that is acceptance of artists, people who think differently, those who don’t participate in the conventional hustle for money, those who just are a little, or maybe a lot, off kilter. There were reasons the beats, the hippies, and gays came here: rent was cheap and the atmosphere was more tolerant than most places. What the writer is asking is for me to see those who have brought the on-rush of this huge amount of capital into the confined world of San Francisco real estate with the same tolerance as I see artists, free thinkers, radicals and outliers. I don’t. There’s been an 8 percent rent increase in the last quarter alone creating a situation where the median monthly rent is $3,400. The number of evictions in the last year, according to the SF chapter of the National Lawyers Guild, was a record 1,700 and that doesn’t include the buyouts renters are taking to vacate their apartments for the wealthy. So while the writer and his friends are not posting eviction notices on the doors of my friends’ homes and tossing their belongings out into the street, the staggering increase in prices has driven landlords to use a number of unethical and even cruel tactics to chase out the rent controlled tenants who might be paying $800 for an apartment the landlord could now rent for $4000. He and his friends may be great people with empathetic souls, but their money is brutal. San Francisco is a boom town, and those of us who grew up here have seen these cycles before. This time, though, it seems like an assault, not just a temporary spike in the economy and here’s why. My income has fallen dramatically because of the digital economy. As a writer I never made that much, but I raised two children on a pretty decent salary as a journalist and then as an author. The digital world has upended the way people pay, or don’t pay, for content. I’m at the top of my skills, but I’m making less now than I did when I was a pup journalist just hired by The New York Times. And while I am an enthusiastic consumer of tech, I am also its victim. These dual assaults on my livelihood and on my ability to afford a place to live in my hometown is what makes it very easy for me to think my world would be better if the tech people lived some place else, like in those apartments Facebook is building next to its new Menlo Park campus. The writer says he and many of his friends would be willing to pay more taxes, which shows a lack of understanding of how local taxes are collected. He can’t pay more taxes on his salary here as it is constitutionally illegal in California to impose an individual municipal income tax. Property tax is set at the state level by Prop. 13. And although it’s not the writer’s fault, San Francisco tax policy favors millionaires. The city gave Twitter a break on payroll taxes that will cost the residents of San Francisco $22 million. The voters just changed that to a gross receipts tax, but mid-Market tech companies get breaks on that tax too. With the Twitter IPO creating an estimated 1600 new millionaires (who won’t have to pay much tax on their stock options) more money is about to flood into the real estate market, making my position here weaker still. He’s right that my anger about that is more properly directed at the Mayor and the griftocrat Board of Supervisors. He says he wants to live here for the rest of his life and enjoy the shops, cafes and the arts. I hope he is able to do that. Yet if the evictions and the rent increases persist, it won’t be the same place he was attracted to originally. He’s right the buses are a symbol that stimulates strong emotions in me as it is difficult to identify individuals with whom I can discuss my anger and frustration. 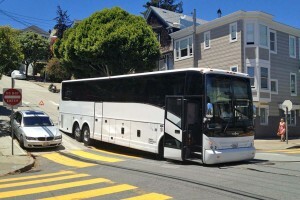 I see the huge buses gliding through the narrow streets of the little village of my old neighborhood, Noe Valley, where I cannot afford to live. There are the tech workers in their shiny cocoons already working on their laptops, oblivious to how much their presence increases the fragility of my connection to the things I hold dear. The urge to stop them at the bus stop is an urge to get them to take their eyes off their screens and look at me and those like me and acknowledge for a moment that they must do something besides have kind sentiments if they want the San Francisco they love to have the qualities that drew them here in the first place. Anyway I am grateful to him for responding and for expressing his opinion in a reasonable fashion, as I have tried to do. I hope others write to do the same. It’s good to have a conversation about this and there is plenty more to say. Danelle, I am eager to see this subject debated. I am just going to pen a few random thoughts to get things started. First of all, as you know, I am a former resident of San Francisco (now live on the Peninsula), Leftist, sympathizer with the plight of those sanfranciscans being uprooted by the recent gentrification….I am also a Tech Worker. Let’s examine the argument provided by the “writer”. It goes something like this. “Look”, he might say, “I haven’t done anything wrong. I like San Francisco and want to live here. What’s wrong with that? It’s a free country.” He doesn’t see that he’s done anything wrong. In reply to his question “What’s wrong with that?” You might find it difficult to give a good response. You just see the result and don’t like it. Long-time residents of the city are being forced to leave. The problem is that if you look at the writers response within the context of bourgeois right, he is indeed playing by the rules. This is free-market capitalism playing itself out in a very nasty way in San Francisco. As demand for housing has increased in a limited market, so will the price. So the question is what to do? First of all, it is really important to raise this problem to the level of politics. Not let it remain at the level of the personal. In other words, just hating on the Yuppie tech workers, calling them names (around the turn of the millenium, “dotcommer” was hurled at them) and sneering at them in the street won’t solve anything. This isn’t a personal problem. This is a “class problem”, a political problem. Class struggle is in order. The solution has to be a political one. Ok, so am I saying that you have to wait for a revolution in order to take action? No. I think blocking the buses is a good first action that helps crystallize the struggle. Other types of mass demonstration are in order. Pressure needs to be brought to bear on the city government to take action. So, to sum up, within the rules as they exist, the writer has done nothing wrong. The landlords have done nothing wrong. BUT THOSE RULES are killing San Francisco. CHANGE THE RULES. That can only be done through mass actions that will force the city government to take action. I agree with Thomas, the inequities are systemic. The villains if you will change in their professions from the real estate moguls of the 80s to the investment bankers of the recent crash, and now the tech sector but for how we mitigate the inevitable unequal distribution of benefits, we have government to blame. I think that the income disparity in San Francisco is another example of the national problem of unequal distribution of wealth. Unless that is remedied there will only be the rarified überclass controlling 90% of the wealth and the vast underclass of 90% of the population whose standard of living will continue to decline. Any person deciding that a city should have this group living in that city and not that group, is a bigot, defined in wikipedia in the following way: Bigotry is the state of mind of a bigot: someone who, as a result of their prejudices, treats or views other people with fear, distrust, hatred, contempt, or intolerance on the basis of a person’s opinion, ethnicity, race, religion, national origin, gender, sexual orientation, disability, socioeconomic status, or other characteristics. When I was a child, my family and I immigrated to the US and moved into a very, very white/Caucasian suburb of Los Angeles. The locals, who had been there for generations, became afraid of us and started spraypainting signs for us to go home. What you are doing is no different – see definition of bigot. My family (starting with my grandparents) has changed countries at least 5 times. Because of political instability and also some hatred, we have had to keep moving. My family through generations has lived in other people’s lands, has been a newcomer in many different cosmopolitan cities. This is what cities do. They change. People come and go. Industries are born and die out. Artists move from San Francisco to Taos New Mexico (what will poor locals of Taos say about weirdo artists that have taken over their town?). What will Detroit say about the devastation it has experienced? You sound just like an English nationalist that is complaining that Indians and Pakistanis are taking over their little quaint village. And though I LOVE visiting quaint little English villages that haven’t changed for generations, I will not enjoy them at the expense of “others” that want to move in and create lives for themselves. In 50 years San Francisco will not be the same. If the tech industry becomes devastated, the entire Bay Area will be affected. If the tech industry moves out, another industry will move in. We must do all we can to ensure that we don’t trample on anyone’s rights. Don’t forget that at least 25% of San Francisco’s population is Asian immigrants. There are also lots of Russian immigrants. And they’re not artists. What were people in Noe Valley saying when the Irish took over the Latino neighborhoods? I’ve spoken to locals of Noe Valley – that neighborhood has changed. Groups have moved out, other groups have moved in. If it feels different this time, it may be simply because the new group that’s moving in this time has a little more money than other groups that have moved in. If you have strong sentiments against people who have more money than you, see definition for bigot. As several people have already pointed out, it’s not about personal enmity towards “Tech Workers”. It’s about an economic structure that allows 1 percent of the population to own 40 percent of the wealth in this country. The next 4 percent own 27 percent of the wealth. The next 5 percent owns 11 percent of the wealth. The next 10 percent owns 12 percent of the wealth. The bottom 80 percent owns 7 percent of the wealth. This disparity is growing. L argues the current displacement in San Francisco is just another shift in demographics as has occurred in the past. I beg to differ. This is not about this or that ethnicity moving into the neighborhood. It is about unfettered capitalism allowing for ever-increasing wealth to be accumulated by the few and ever-increasing misery to be inflicted on the many. And the problem is not peculiar to San Francisco. Those driven out of San Francisco will be shadowed by their poverty to the ends of the earth. The problem is global. There is no OUTSIDE to the problem. No place to hide, not even in Taos. Not viewing this problem from a larger socio-economic perspective, keeping it at the personal level, allows for the kind of rhetoric that L employs here. The solution is not to demonize Tech workers. Nor is the solution to roll-over, play dead and pack your bags for Taos, as L suggests. The solution is to stand and fight. This means mass demonstrations and formulating political demands on City Hall to stop the gentrification. If fighting for the right of the less-privileged citizens of San Francisco to stay in their homes is bigotry, then I am indeed a bigot of that order. For a long time it was economically reasonable ‘policy’ to move the jobs to the people rather than the people to the jobs. This was for obvious reasons: the costs to areas that suffer the exodus are greater than the benefits of those that see the inflow. We tend to dismiss the fact that those destinations in fact become overfilled with people who live in cramped spaces with no social ties and overstretched infrastructures and this is not to mention the deserts they leave behind (because they might look like aliens but they still come from somewhere!) or to the new ghettos they create by pushing people out. What’s blinding people and some urban policy makers to this basic banality is that we have recently seen the creation (in our imagination) of a better class of workers who are themselves seen as ‘innovation-bearers’ and who bring capital (first social then economic) to a region. Attracting this ‘talented class’ becomes a substitute for or an alibi for institutions not to innovate themselves or generally do much about anything apart from keeping the region attractive to this desirable citizen-prosumer class that will eventually bring the business in, using all sorts of spurious whoring and utterly disputable indexes in the process (there are bohemian indexes, gay indexes, people climate scores etc.). This whole recent outlook is poorly supported by evidence but nonetheless, a bit like the hysteria of financial speculation, it generates its pernicious effects and catch 22s. Evidence in fact, unsurprisingly, suggests that workers tend to move where there are jobs available and better work conditions, not consumable amenities, and that they do not value ‘mobility’ as much as it is thought. There is an illusion of freedom on both sides: both of workers moving where they ‘like’ to live and of businesses to be unconstrained in chasing after them. It’s short termism pure and simple, all geared to bring growth (by looking acritically at where it went yesterday and badly mimicking without understanding why) with no clue as to making this alleged growth sustainable (excuse the buzz words). So everyone is chasing after everyone else, constantly displacing and deterritorialising because that is simply how schizocapitalism works and the only way it knows how to sustain itself systemically whilst just about keeping us alive to feed off.